Maple Glazed Carrots recipe with fresh thyme, topped with goat cheese and cracked pistachios. A simple and fresh carrot recipe that is perfect for fall! It’s fall, the season of squash, root vegetables, and everything maple. A time for cozying up indoors with a warm blanket and a plate of hearty (and healthy) food. One of my favorite easy autumn recipes is a simple roasted carrot with a maple glaze. 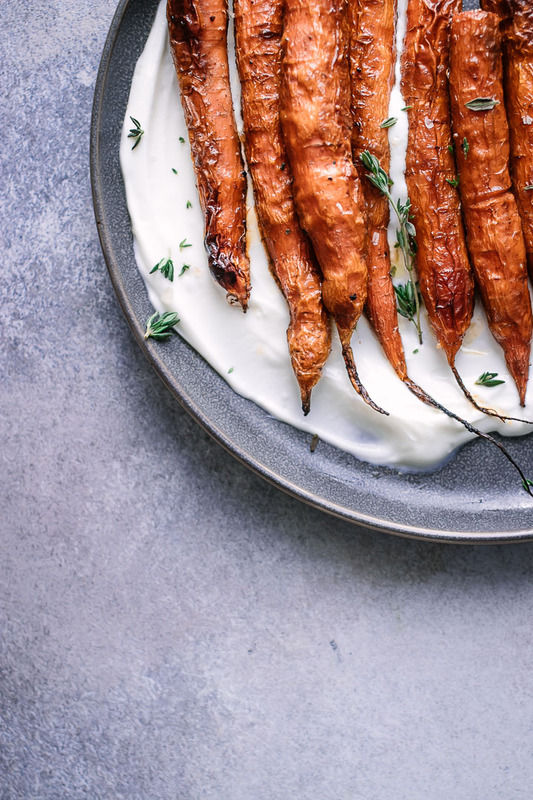 The earthy and sweet flavor of freshly roasted carrots pairs perfectly with maple syrup, and paired with a dab of fresh yogurt and sprinkled thyme. It’s like fall on a plate! Want the so-simple glazed carrots recipe? Let’s do it! First, it’s important to choose a good carrot. 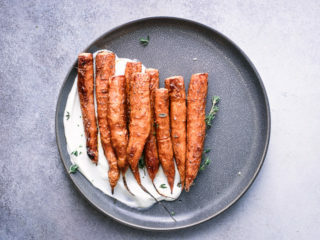 While you may think all carrots are the same, I personally find that organically grown carrots have a much sweeter flavor and yield a much tastier end caramelized carrots dish. 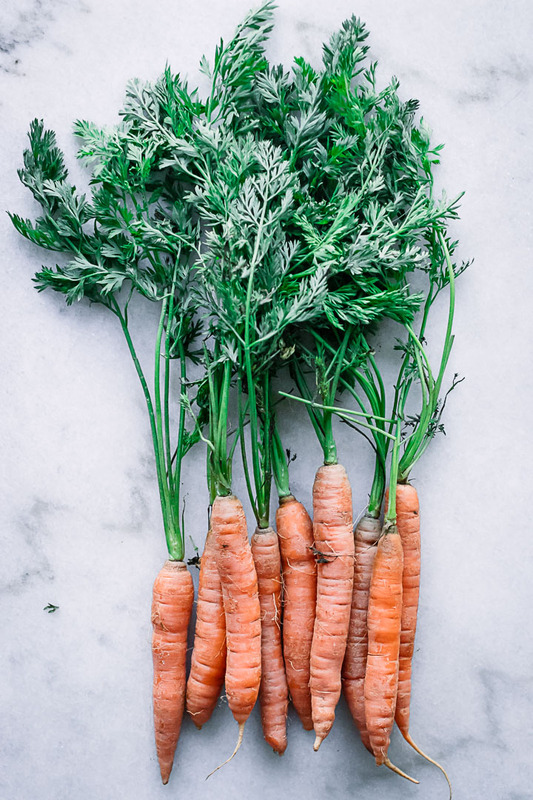 That’s why I choose Nantes carrots, which are a smaller (6-7 inches, 15-18 centimeters) carrot variety that does well in harsh soils–which actually makes for a sweeter and earthier carrot overall. However, if pressed any carrot will do because the sweet maple syrup and goat cheese combination will make any type of carrot taste delicious. Once you’ve selected your carrots, cut off them stems (and save them for Carrot Top Pesto!) and scrub carrots with a vegetable scrubbing brush to remove any dirt. Unpeeled carrots are perfectly safe to eat, a nice scrub will remove any dirt and debris and they’re ready to go. Next, toss carrots with a bit of maple syrup and roast on a baking sheet with a bit of butter (vegan butter if you’re plant-based) until the carrots are slightly soft and browned, about 20 minutes. Remove and plate them on top of plain yogurt (I choose whole milk) and top with fresh thyme and a sprinkle of smoked sea salt. A delicious and simple autumn dish that is perfect on its own or as a side! I hope you enjoy this simple roasted maple glazed carrots recipe as much as we do! It’s the perfect side dish for fall meat or pasta recipes, and can even be a great addition to your green Thanksgiving menu. Craving more simple fall vegetable recipes? Check out our Roasted Brussels Sprouts with Shallots, Maple, and Mustard and Roasted Beet Fries recipes, both easy vegetable-based side dish recipes utilizing fall’s best produce and flavors. 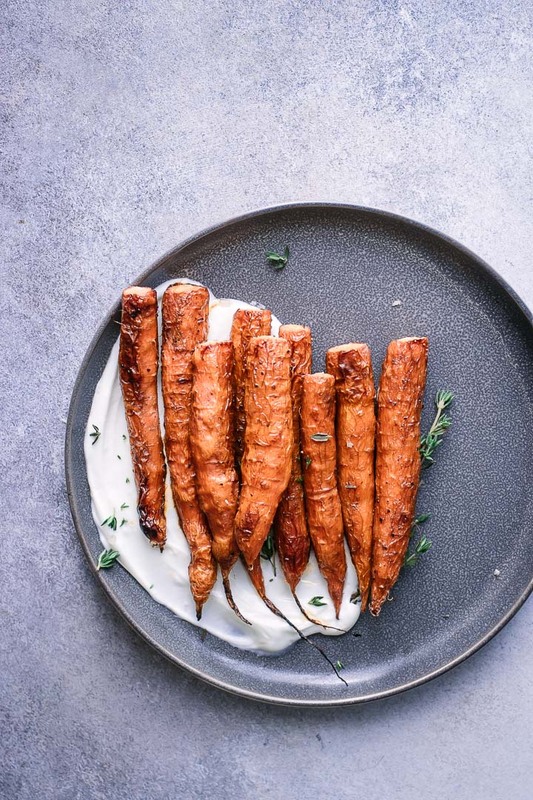 Did you make this Maple Glazed Carrots recipe? Leave a comment below and rate the recipe to let us know how it turned out. 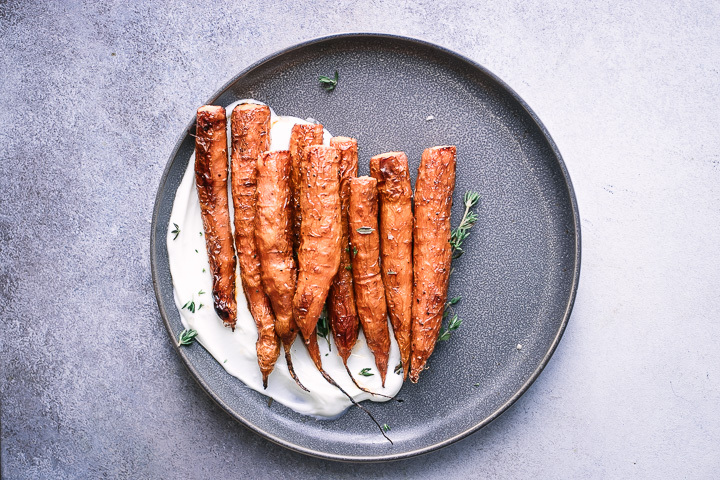 Save this recipe for later by pinning to your favorite fall Pinterest board and make sure to tag me on Fork in the Road’s Instagram to show me your candied carrots creations! Preheat oven to 400 degrees F (200 degree C). Toss carrots in maple syrup and sprinkled with salt and pepper. Add oil to baking sheet and spread carrots evenly, then top with pieces of butter. Roast until carrots soften and begin to brown, about 20 minutes, stirring throughout. Remove carrots from oven and move to plate spread with yogurt. Top carrots with fresh thyme and pinch flaked sea salt.